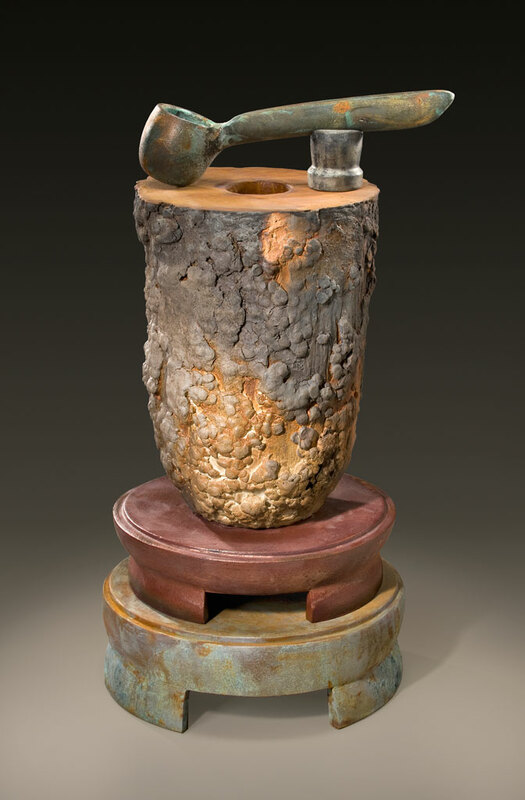 Frans Wildenhain’s long-reaching influence continues to touch the art and greater Rochester, NY community with the opening of “Enlightened Earth: The Ceramics Invitational” at Nazareth College’s Art Center Gallery. Just over two-dozen artists with as many objects went on display beginning Friday, 20 January. The exhibition (and sale) runs through 10 March. Among the objects on display is work by two Wildenhain students: Nancy Jurs and Rick Hirsch. Jurs, a Wildenhain student in the 1960s, taught at RIT as an adjunct professor and is a widely exhibited ceramist and sculptor. Recent venues presenting her work include the Everson Museum of Art (Syracuse) and the Burchfield Penney Art Center (Buffalo). 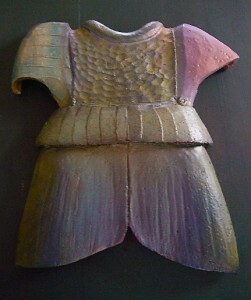 For the Nazareth exhibit she offered a framed and wall-mounted sculpture entitled “Brutus” which is from a series. Interestingly, Jurs is related to the long-time (1918-1952) Mechanics Institute/RIT ceramics department chair, Lulu Scott Backus. You’ll read more about Backus in the Wildenhain exhibition catalogue. Also widely exhibited, and with several books reporting on his art, Rick mentioned to me an upcoming exhibition at the Vignellii Center for Design Studies Gallery on the RIT campus where his collaborative work with glass artist Michael Rogers will debut. Stay tuned. The other artists featured at the Gallery are Ted Aub, Darien Johnson, Lori Mills, David MacDonald, Peter Pincus, Mitch Messina, Kate Whorton, Robert Wood, Margie Hughto, Anne Currier, Jane Shellenbarger, Linda Sikora, Bill Stewart, Jeff Kell, Stephen Merritt, Fred Herbst, Moi Dugan, Richard Aerni, John Gill, Phyllis Kloda, John Tracey, Erroll Willet, Mike Carroll and Carol Townsend. Friday’s opening reception was packed. So much so that I was nervous for the safety of vases and vessels perched atop pedestals and amid a generous-sized and enthusiastic crowd. While there, I noticed a few red dots appeared, indicating sales had occurred. The Gallery is located on the Nazareth campus, 4245 East Avenue, is closed on Mondays and open noon to 5 p.m. all other days and until 8 p.m. on Fridays and Saturdays. Call 585-389-5073 for information.